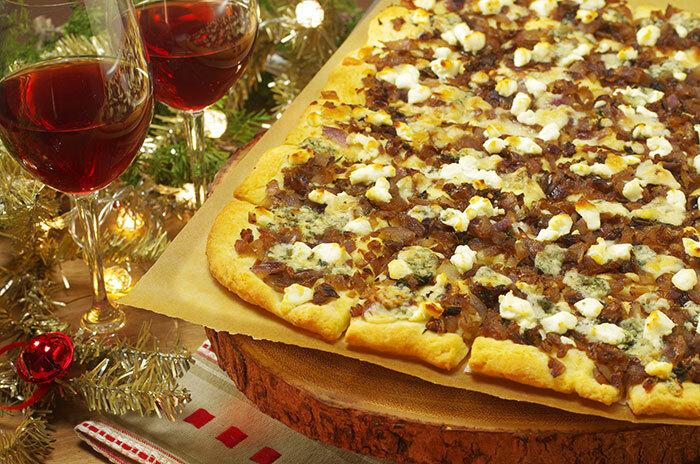 These elegant squares are made with slow-cooked caramelized onions, pungent blue cheese, and a tangy goat cheese. They’re a terrific addition to the holiday buffet table or to serve as an hors d’oeuvre before dinner or at a cocktail party. Cabernets pair very nicely with blue cheese dishes. Preheat the oven to 425°F/220°C/gas7. To make the crust: In a medium bowl, stir together the flour, baking powder, and salt. Make a well in the center of the mixture. In a measuring cup, whisk together the milk, olive oil, and melted butter. Slowly pour the milk mixture into the well, stirring until just blended and the mixture comes together into a rough mass. Turn out the dough onto a lightly floured work surface and roll out into a 10-by-13-in/25-by-33-cm rectangle. Transfer the dough to a baking sheet/tray. Pierce the dough all over with a fork. To make the topping: In a large skillet over medium heat, melt the butter with the olive oil. Add the onions and cook, stirring frequently, until softened and lightly browned, about 10 minutes. Add the thyme, sugar, and salt and pepper to taste, reduce the heat to low, and cook, stirring frequently, until the onions are soft and caramelized, about 20 minutes. Spread the onion mixture evenly over the dough. Sprinkle with the cheeses, cut into squares with a pizza wheel or a sharp knife, and bake until the crust is golden and the cheese is bubbling, about 20 minutes. Transfer to a wire rack and let cool a bit on the pan. Serve warm or at room temperature.